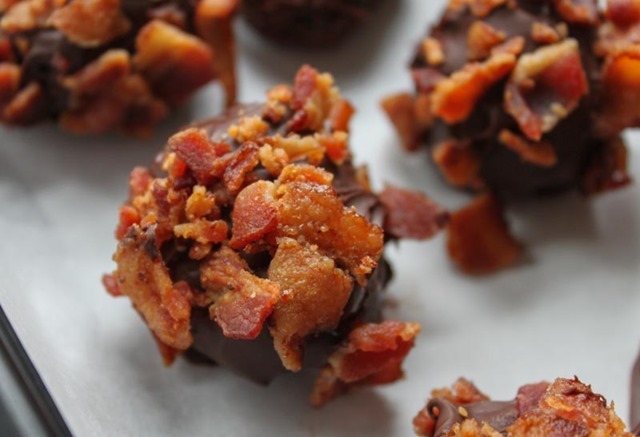 Today I’m going to ask you to consider candy making. Hear me out! Right now you’re looking at these pictures thinking I did something fancy and difficult. But I didn’t really. 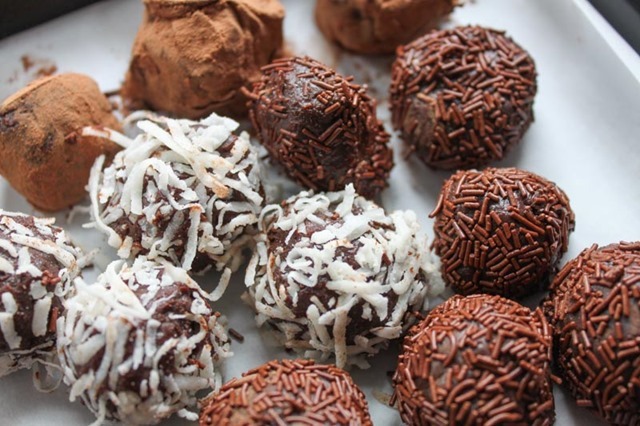 These truffles are insanely simple. So much so that I actually don’t want to show you how, because I like the thought of these truffles looking hard won. But, let’s be real, you could do this in your sleep. 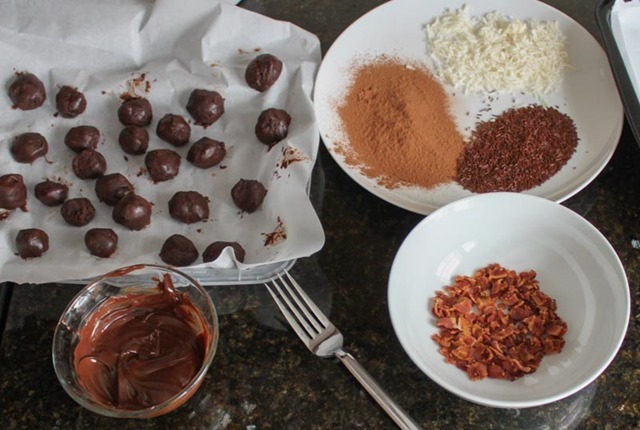 All you need to make truffles is chocolate ganache. 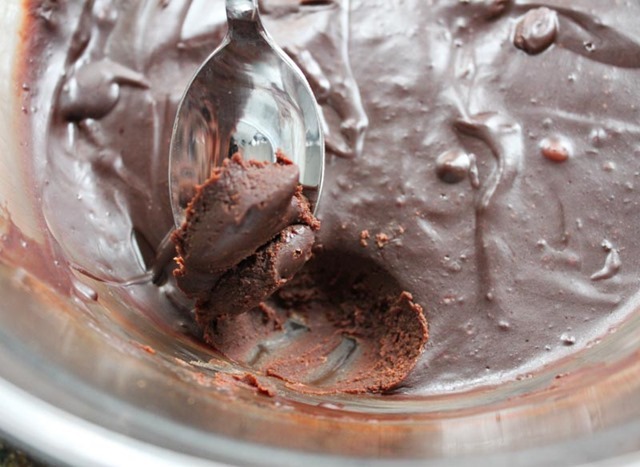 And all you need to make chocolate ganache is this recipe. 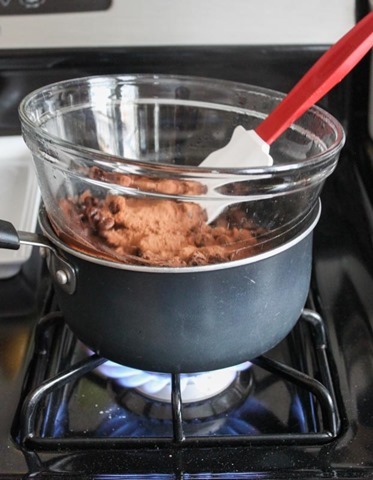 To begin to make the ganache, melt the chocolate chips over medium heat in a double boiler. When the chips have melted, remove the bowl from the heat. 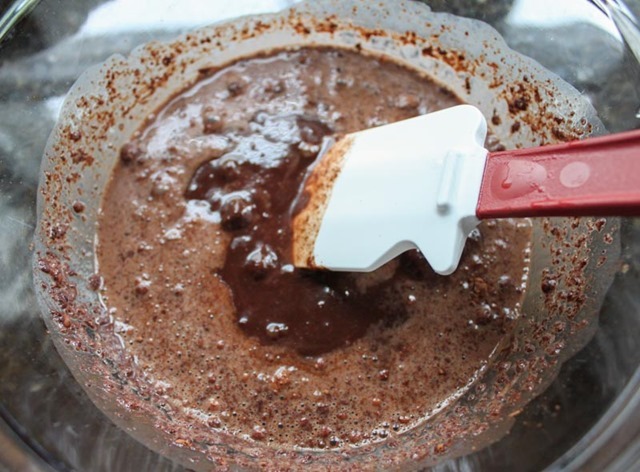 Next, add the espresso powder, cocoa powder, cream, vanilla, and golden syrup to the bowl. 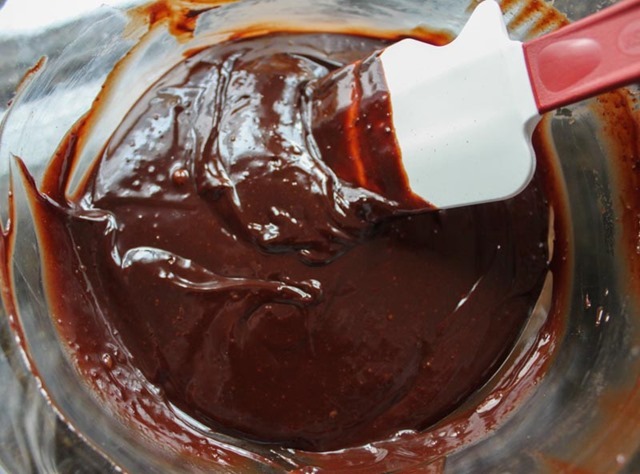 With the bowl off the heat and the rest of the ingredients added, stir slowly to combine until the ganache is uniform and smooth. Cool on the counter for 20 minutes or so then place the chocolate ganache in the fridge for 5 hours or the freezer for 3. You’ll know when the ganache is ready because it will be set and hard; it will be firm to the touch and will hold its shape when scooped. 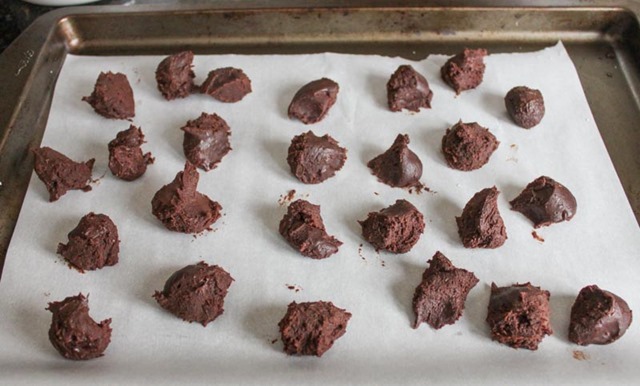 Scoop out 1 teaspoon ganache pieces and place on a parchment paper lined baking sheet. 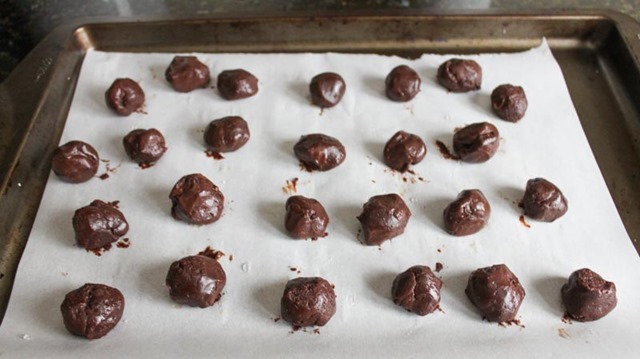 When all of the ganache is used up, roll the pieces into uniform balls. I like to dip my fingers in cool water before rolling in my hands that way they won’t stick as much and won’t melt the ganache as quickly. 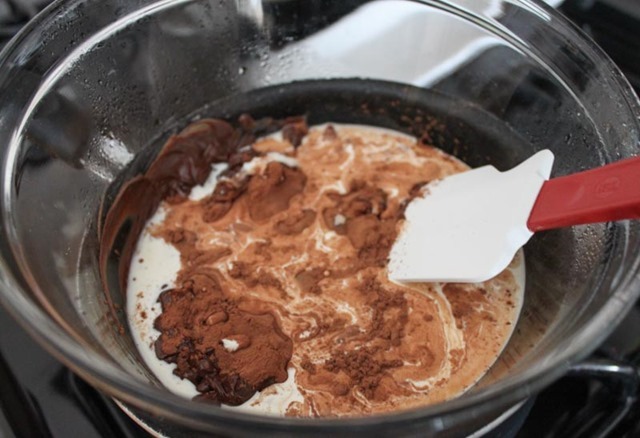 At this point you are ready to roll the ganache balls in whatever toppings you like! Because they are slightly damp the toppings will adhere easily. 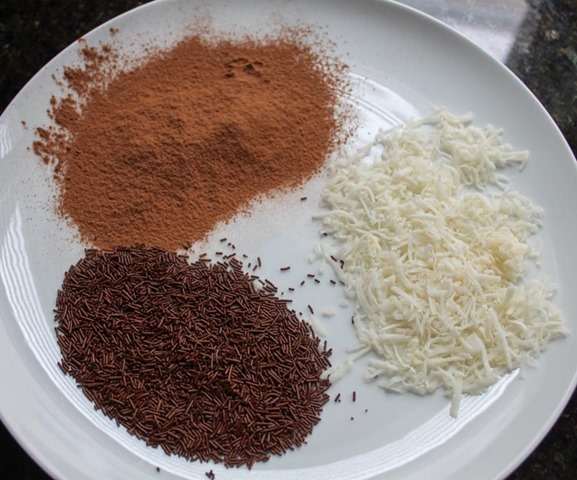 The toppings I used were bacon, coconut, chocolate sprinkles, and cocoa powder. While rolling be sure to use your fingers to press on the larger pieces like bacon and coconut. An assembly line set up works best here. Eat immediately (because how can you not) or store in the fridge in an airtight container for up to 5 days. 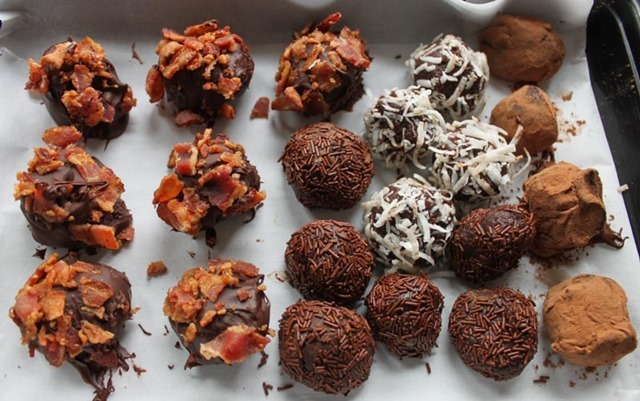 These truffles are a must for your next party (also because they are a total make-ahead). Everyone will think you slaved over them but I will keep this our little secret! Oh, have mercy! These look so delicious and easy to make. And I hear chocolate is actually good for you. Guess I’d better scoot to the kitchen and get busy :-) Do you know if they freeze well? I’ve got a FoodSaver that works well on just about anything, but I think the bacon would need some crisping up. Perhaps I’ll give it a go and let you know how it works out. Yes, these would freeze perfectly for probably a few weeks in an airtight container or ziplock bag. Please do let me know if you try them and how it goes!